sarah’s Chuckles 1) If you were a superhero or villain, what would your superpower be? Laughter, because everyone deserves to smile, be happy and have fun regardless of anything. 2) If you were at a karaoke bar, what song you sing? ‘Happy’ by Pharrell. 3) What is your idea of perfect happiness? Sea, sand, a good book and a bottle of …… water ! 4) Why do you love to Chuckle? I love to see a smile, a hello, a thank you, a new experience, a connection that makes a difference in a young persons day/life and a difference to their families. 5) What is your most treasured possession? My teddy bear that I had in my cot when I was a baby! So it is now a little bit old …… but young at heart ! Lead Workshop Facilitator Sarah is a qualified primary school teacher with 13 years experience, a qualified SENCo and has supported many children with a variety of physical and educational needs. 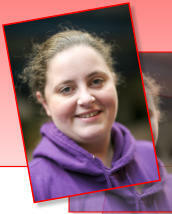 Sarah has also been a dance teacher, working alongside Sara for many years. Sarah has a passion for seeing all children achieve their full potential and that is what drives her to work at Chuckle and see the progress that all young people can make. She is a dreadful singer but that doesn't stop her! In her spare time she is a First Responder too!